Students will be taught the basic knowledge and skills to offer direct chairside assistance to the dentist, expose dental radiographs, and educate and instruct patients in preventive dental techniques. Students will be trained in infection control procedures, disease prevention, dental procedures and instruments and business office procedures. Upon successful completion of the program and in accordance with state guidelines, students are issued an Applied Technology Diploma (ATD) in Dental Assisting Technology and Management with Expanded Duties and Dental Radiography. Registration processes for Health Science classes vary by program. For information specific to Dental Assisting Technology and Management, please e-mail the counselor at Ruth.Eloi@browardschools.com. The Dental Assisting Technology and Management program is accredited by the Commission on Dental Accreditation. The Commission is a specialized accrediting body recognized by the U.S. Department of Education. The Commission on Dental Accreditation can be contacted at (312) 440-4653 or at 211 East Chicago Ave., Chicago, IL 60611. The Comission’s web address is: https://www.ada.org/en/coda. Upon successful completion of the program and in accordance with state guidelines, students are issued an Applied Technology Diploma in Dental Assisting Technology and Management with Expanded Duties and Dental Radiography. Upon completion of the program and meeting eligibility requirements, including the attainment of an aligned industry credential, students may be awarded credits toward an AS/AAS Degree by Broward College or the Florida College System. Students must enroll in Broward College within 2 years of completing the program at Atlantic Technical College. Additional college credit may be awarded with the attainment of additional industry credentials. To get started in the Dental Assisting Technology and Management program, sign up today for a program orientation! 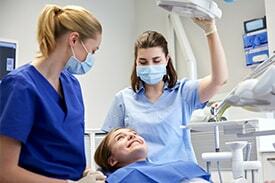 Demand for Dental Assistants is expected to grow about 15%* between 2015 and 2023. Entry level wages for are about $14/hour**. Actual wages vary according to education, experience and certifications.